The professional craftsmen at Home Remedy can provide you with complete bathroom remodeling in Houston and surrounding areas. 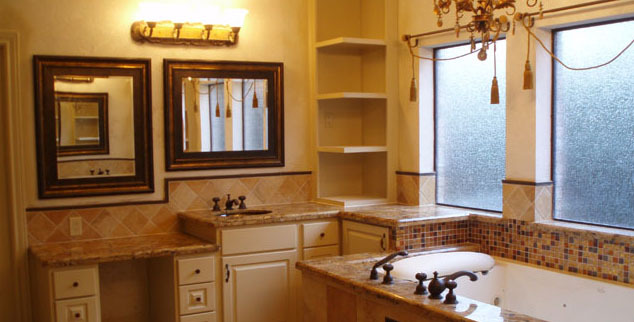 Houston bathroom remodeling is something we have been doing for many years. We take great pride in our ability to completely renovate your outdated bathroom with a completely custom bathroom re-finish. We know that when we combine our expertise with your vision that we will truly make your dream come true with our dedicated home remodeling services. If you are contemplating a bathroom remodel, one of the first things to consider is the type of bathtub you would like to have. At Home Remedy, we supply a large selection of bathtubs that give you the ability to find the perfect tub for you based on color, style, and shape. We offer a large array of bathtubs including but not limited to walk-in and Safety Tubs, Jacuzzi tubs, jetted tubs, spa tubs, and deep soaking bathtubs. Call us today to find the perfect “Home Remedy” your bathroom has been missing. Home Remedy offers a wide selection of bathtub, shower valves and various other bathroom faucets. Our variation of bathroom fixtures includes wall mounted shower heads, rain shower heads, body sprays, and hand showers. Also, select from contrasting styles such as traditional, Victorian, modern, and classic; and extend your choice based on the type of finish, selecting from Bronze, Chrome, and Stainless. Complete your beautiful Houston bathroom remodeling with these luxurious upgrades. Are you looking to upgrade flooring but don’t know the right look for you? Home Remedy of Houston has the perfect flooring solution for you. Our flooring experts have the knowledge and experience to give your bathroom the distinct look you have been looking for. Our flooring options are easy to maintain, and offer materials that do not “ware” over time. Call us today to hear about our flooring options that do not stain, scratch, or “collect water”. Bathroom renovation can be as easy as replacing your shower curtain with very appealing shower doors. At Home Remedy our bathroom renovation experts know exactly how to pull your vision into a reality. Use one of our beautiful shower doors to reignite the beauty in your Houston bathroom remodel project. A vanity top is the precise way to pull all of your bathroom improvement efforts together. No matter what style or color you are looking for we will be the best fit to pull your bathroom design together. Pronounced (Weyn – Scot – ing) Is a process and type of installation of paneling or woodwork. Wainscoting is a great benefit to you in appearance and functionality. It is an absolutely fantastic way to give the appearance of a larger area, while simultaneously creating an interior design appeal. Also, wainscoting is a practical way to prevent mold, mildew and wear and tear on the walls outside your tub and shower. Don’t finish your bathroom remodeling and renovation project without this feature!! !